Well, the reno is progressing! The shower is now in and ready for a ceremonial first use. 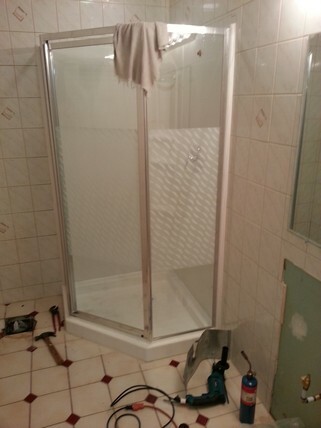 The installation was difficult because the 1/2 inch difference in the floor drain dimensions for the new shower required the shower to be built out an additional half inch from the wall, which meant an additional layer of drywall followed by some closure pieces on each side. The shower didn't come with towel racks on each side like the old one did, so that's something to be added as a finishing touch. The next part of the project has been to prepare for the new toilet installation. 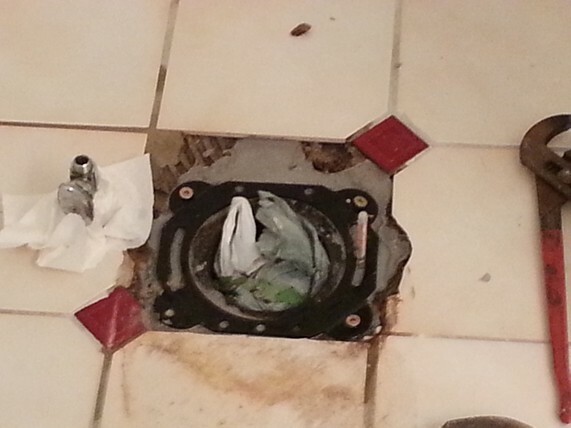 When the toilet was installed, the toilet flange installed was plastic with a steel ring that provided the anchor that holds the toilet bolts (and the toilet) to the floor. The old toilet was rocking a bit, when taken out it was obvious that the steel ring was rusted away. Since the drain pipe is cemented into the concrete floor, a flange repair kit was anchored down into some "anchor bolt cement" that was poured for the purpose, then concrete screws were drilled into the cement to hold the new flange piece down. This was a lot easier than taking a jack hammer to the concrete floor to replace the plastic toilet flange (Suzette would not have been a happy camper!). The final obstacle that occured was that the water valve shown in the picture (shuts off water to the toilet) passed a smal amount of water when closed, cleaning out the valve and an extra quarter turn on the handle stopped the leak. Al didn't want to replace the valve as it's the low point and always has residual water in it, tough to remove and re-solder a new valve in. There is another shut-off upstream so if the valve passes water in the future it can still be isolated. A new toilet will be selected and installed early next week, the new vanity will arrive when we are on our trip to northern Ontario, so Al Gets a reprieve until later in the summer to complete the reno! Now that we've been home a couple of weeks it's time to get going and do some work. 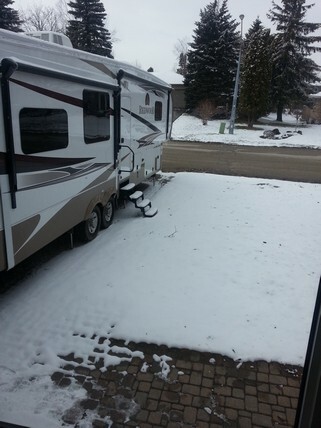 The weather up until today wasn't too bad, all the snow and ice that was around when we got home had disappeared by yesterday, the temp got up to around 20C (68F) and we took the opportunity to clean up the yard (mostly Suzette! ), the truck is now loaded with a full load of yard debris in bags along with some stuff from the bathroom (see below), it's a dump run day tomorrow. The Town was kind enough to come by with a chipper to get rid of the large branches that fell off trees during the December ice storm, but we still have to call an arbourist to look after some broken branches on our walnut and a birch in the yard. We had a return to winter overnight, the temp dropped to below freezing and we had some freezing rain and a few inches of snow!!! The cold weather is great for getting some indoor work done. The downstairs bathroom ("Al's bathroom!") 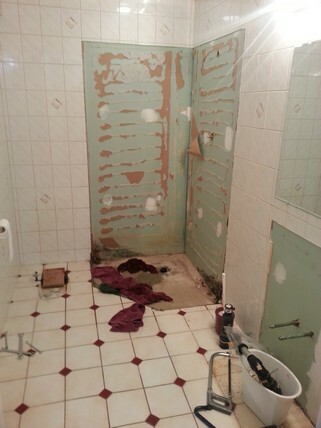 needed a complete redo as the shower was aging and Suzette said that the stuff was the wrong colour! So, Al moved into "Suzette's bathroom", it was kind of like moving into a woman's apartment, the man gets one shelf and a half a towel rack, the rest of the bathroom is off-limits. 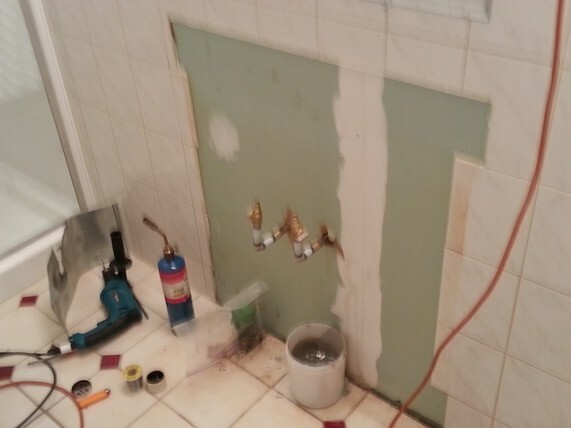 There was some leakage of water around the shower edges over the years, some drywall work will have to be done prior to the new install, and the shower lever broke during the removal so the plumbing will have to be re-done. The water on the floor is from the toilet removal, the area under the shower base was dry so at least the drain was working well! 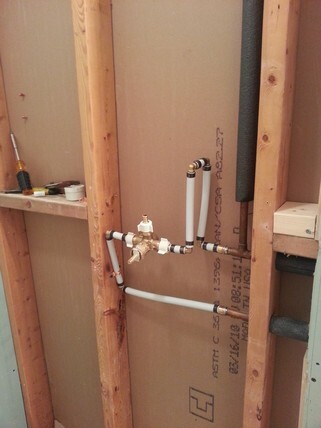 A new shower is sitting in the garage awaiting installation. Al is following the union rules (half hour of work then a 90 minute break!) so the progress is slow, it might speed up if he is thrown out of Suzette's bathroom!